The Nvidia GTX 1050 Ti is a mainstream GPU based on the Pascal architecture and was announced in January 2017. Contrary to the faster models, the GTX 1050 uses the GP107 chip, which is manufactured in a 14 nm process at Samsung. The notebook version differs a bit in terms of clocks, but is equipped with 768 shader units, just like the desktop model. It is shipped with up to 4 GB GDDR5-VRAM attached via 128-bit interface and a 7 Gbps memory data rate (112 GB/s). The performance of the GeForce GTX 1050 Ti can vary quite a lot depending on the cooling performance of the laptop. It can be just as fast as the desktop model under ideal conditions. The GeForce GTX 965M and the regular GTX 1050 are beaten by around 30%, so the GTX 1050 Ti is comparable to a GTX 970M in general. It is therefore an upper mainstream GPU. Games from 2016 can be played in high settings an the Full HD resolution. 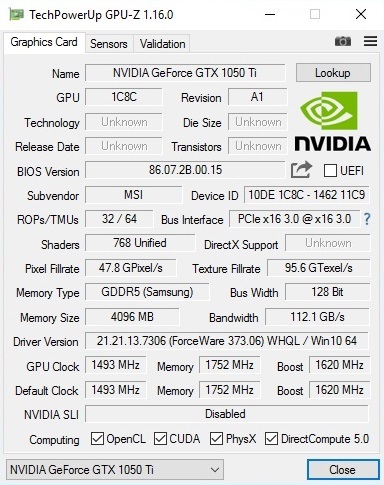 The power consumption of the GeForce GTX 1050 Ti is roughly on par with the old GTX 965M, which would mean around 70 Watts and (probably due to better selection and optimized parts) therefore slightly lower compared to the desktop counterpart. This means the graphics card will usually be used for powerful multimedia notebooks and entry-level gaming systems with at least 15.4 inches.